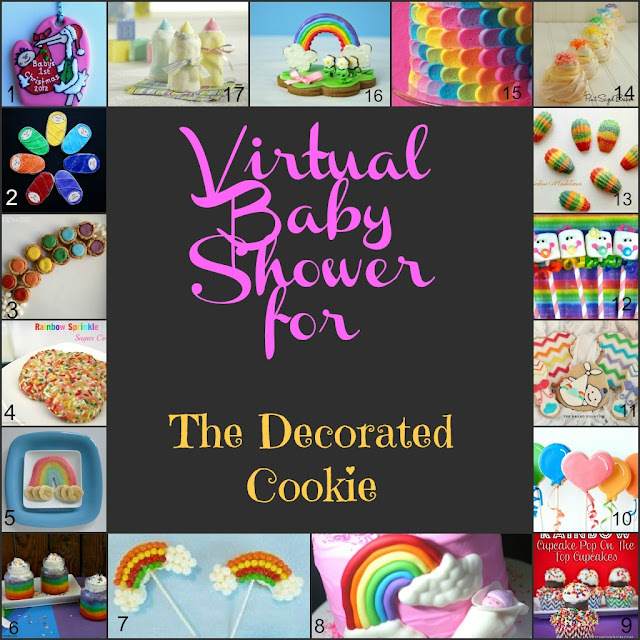 Michelle (Sugar Swings, Serve Some) contacted me (and other bloggers) with the awesome idea of throwing a virtual, rainbow-themed, baby shower for Meaghan (The Decorated Cookie) in honor of her new, little sweetie, Violet:) Meaghan is a friend to many (including me!) and is so generous in promoting bloggers on her other site, Edible Crafts. She's also crazy creative (think Mr. Melty, the original melting snowman cookie...yep, she's the creator! ), and has been an inspiration to me for years! I know that Meaghan is as crazy about cookies (and other treats) on-a-stick as I am, so I thought this would be the perfect sweet treat to bring to the shower. 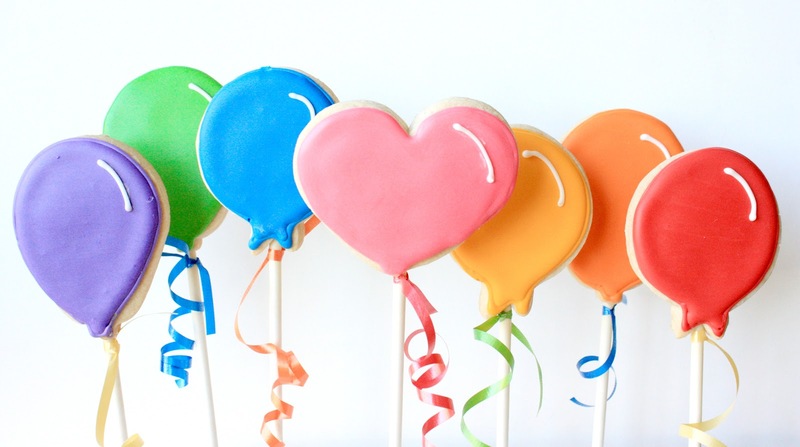 I mean really, what is a celebration without balloons, especially cookie balloon pops! The bright, rainbow colors just lend themselves to the joyful occasion. Mix well. Use right away or place in refrigerator. Roll to desired thickness and cut into desired shapes (Roll them on the thicker side to make into cookie pops). Place on the cookie sheet, but leave room for the sticks. Insert stick gently, but firmly. I usually press down gently on the cookie with my left hand, while I insert the stick with my right hand. You may even want to make a small slit with a sharp, small knife to make insertion easier. Bake on ungreased cookie sheet at 350 degrees for 8-10 minutes* or just until beginning to turn brown around the edges. Let cool on the cookie sheet for about 15 minutes. Transfer to cooling rack (place spatula under the spot where the cookie and stick meet, for support, as you transfer them). Decorate with a variety of colors of royal icing. Let dry completely. Tie curly ribbon at the top of each stick, and curl. *My cookies seem to take about 15-18 minutes to bake. It may be because of their size, or my oven. Start timing on the low end because you can always add more time...just keep an eye on your cookies to achieve desired doneness. After you outline the borders of your cookies, you need to allow them to dry before you fill them in. I usually allow at least 15 minutes. Then you can fill them in...I icing bags. Let them dry at least an hour before adding any details. I usually let them dry overnight after this step, just to make sure that they are good and dry! Yep, it's time consuming, but worth it! After they are completely dry, they can be stacked (to store) or packaged:) Hope these tips help out! Sue, you really come up with the best cookie ideas! :D Violet is a gorgeous name! These are so happy, I love the first photo so much, Happy Happy Happy. Awww - love this, Sue! The ribbon detail is such a fun element. I love the way you think!! What a cute idea...love that ribbon! Balloon rainbow cookies!! you can't ask for anything better. I love them! AAAAAAGGGHH!!!! You know I'd bawl, right?? This is amazing! I'm going to go tour the rainbow. You've just made one happy mama!! How cute with the added ribbon! All the balloons are so sweet and bright colors are just perfect! What a fun idea to have a virtual shower. Everything is just adorable. Those balloons would be perfect for so many parties. I love the colors and designs. You never cease to amaze me. What an adorable virtual shower gift! What cute cookies! And what a fun idea. I'm off to check out the other cookies. Perfect, these would make an awesome baby shower present or favor. This is adorable! I love them! I was so happy to have been a part of the shower!